Udupi, April 3, 2015: The swimming pool at indoor stadium constructed by the department of Youth Empowerment and Sports is almost ready for inauguration in Udupi district. It is expected to be inaugurated in a few days time. This a long pending desire of the people of the district. A memorandum demanding the swimming pool was submitted to then Chief Minister D V Sadananada Gowda during his visit to the district, who approved it and foundation was laid without delay. Later, it was Minister for Youth Empowerment and Sports Abhayachandra Jain who released Rs two crore for the pool and the work commenced last year. Also the swimming pool for seniors citizens and children are ready. The senior’s swimming pool is 25 metre long and 22 meter wide. 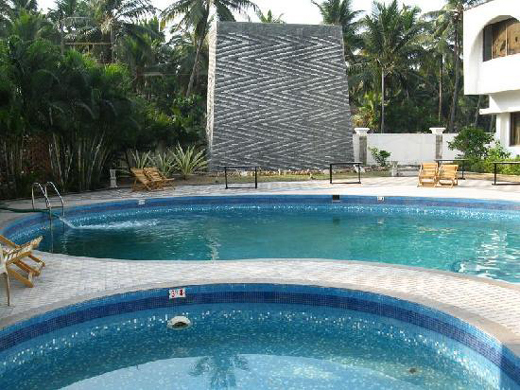 The junior swimming pool is 10 meter long and 6 meter wide and about 1 mtrs deep. The swimming pool will qualify for conducting district-level swimming competitions. To organise state-level event, the length of the swimming pool should be 50 meter. Along with the swimming pool, 10 each shower cubicle are constructed for men and women separately. A dressing room is also ready. To supply water to the swimming pool, a borewell has been provided. The water will be purified before supply to the swimming pool. Officials said that the swimming pool will not be maintained by the department of youth empowerment and sports. Tenders will be called for to maintain the pool. The tenderer will be entrusted with the responsibility to maintain safety, cleanliness, payment of electricity bills The tenderer will be responsible for appointing life guards to teach swimming and also look into safety. The public will be have entry to the pool at a fixed fee it was stated. Department of Youth Empowerment and Sports Assistant Director Dr Roshan Kumar Shetty said that separate timings will be fixed for men and women. This will facilitate children who would like to learn swimming and also for other swimmers. So far the district did not have either a government or department swimming pool, and depended on private swimming pools. The new swimming pool will be a blessing for the public in many ways.